HARRISBURG, Pa. – The Pennsylvania Department of Agriculture has added Dauphin County to the list of counties under quarantine regarding the Spotted Lanternfly. Dauphin County joins Berks, Bucks, Carbon, Chester, Delaware, Lancaster, Lebanon, Lehigh, Monroe, Montgomery, Northampton, Philadelphia and Schuylkill Counties on the list of quarantined areas. Any commercial vehicle that makes any stop in this area must have an orange spotted lanternfly permit from the Department of Agriculture or the corresponding temporary paperwork. Without the permit, drivers are subject to fines and a citation. While the quarantine has been in effect for more than four years, the agriculture department made major changes to the program in May of 2018 by instituting the use of a permit system. The permits replace the compliance program that was previously in place and is designed to be easier for organizations to acquiesce as well as easier for the state to enforce. The Department of Agriculture and the Pennsylvania State Police are joining forces beginning this May to amp up their enforcement of the quarantine. They will be setting up checkpoints around the quarantined area to ensure that the proper permits are on board. The permits are free to obtain. An owner, manager, supervisor or other designated employee must complete the online course (accessible at extension.psu.edu/slf-permit) and then disseminate that information to all drivers. After the online course is passed, a printable certificate will be available and that will suffice as a permit until the physical stickers or window hangs arrive in the mail. The shipping process may take two to three weeks. Organizations may request as many permits as they need once the online course is passed. Work includes ramp resurfacing, and concrete median barrier and guiderail replacement. Harrisburg, PA – The Pennsylvania Department of Transportation (PennDOT) announced today that starting at 9:00 PM Sunday, March 17, its contractor will begin a nighttime milling and concrete patching operation marking the start of a project to repair and resurface a 1.3-mile section of Interstate 83 from the Yellow Breeches Creek at the Cumberland-York County Line to the Susquehanna River. The $4,144.090 contract was awarded to Hempt Bros., Inc. of Camp Hill, Cumberland County, and includes concrete patching, milling the top layer of asphalt and resurfacing with a 4.5-inch Superpave asphalt overlay, replacing concrete center-median barrier, and installation of new guiderail, signs and pavement markings. Work under this construction contract is scheduled to be completed by mid-September 2019. PennDOT advises motorists that during working hours motorists may encounter single-lane restrictions through the work zone, Sunday through Thursday from 9:00 PM to 6:00 AM, as crews mill and patch I-83 in preparation for asphalt paving later this summer. Eventually it may be necessary to temporarily detour traffic when overnight work is scheduled to repair and resurface ramps within the New Cumberland (Exit 40-B) and Lemoyne (Exit 41-B) interchanges. Later this summer crews will schedule long-term single-lane closures in both directions over four weekends, from 9:00 PM Friday through 6:00 AM Monday, to replace the concrete median glare screen barrier that divides the highway. None of these restrictions will be scheduled over the busy Memorial Day, Independence Day, or Labor Day holiday weekends. I-83 averages more than 33,000 vehicles traveled daily through Cumberland County in either direction. Average daily traffic volume on northbound I-83 increases to nearly 50,000 vehicles per day as you approach the John Harris Memorial Bridge over the Susquehanna River. To avoid delays, travelers should allow for additional time in their plans or seek an alternate route. Nighttime work is expected to occur more frequently and consistently as we move into the spring and should be expected each night, weather permitting, between March and September. Travelers are reminded to be alert for these operations, to obey work zone signs, and to slow down when approaching and traveling through work zones, not only for their safety, but for the safety of the road crews. 2-year project will widen State Road, replace bridges over Amtrak and Route 283. Harrisburg, PA – The Pennsylvania Department of Transportation (PennDOT) announced today that on Monday night, March 18, weather permitting, its contractor will place barrier closing the right shoulder along eastbound and westbound Route 283 and shift traffic toward the median in each direction through the Route 722, State Road interchange in East Hempfield Township, Lancaster County. This work marks the start of a reconstruction project that involves the widening and replacement of the Route 722 bridge over Route 283 and the municipally-owned State Road bridge over Amtrak railroad. The $18,467,109 contract was awarded to New Enterprise Stone & Lime, Inc. of New Enterprise, Bedford County, and includes the widening and reconstruction of State Road through the Route 283 interchange under phased construction, replacement of the Route 722 bridge over Route 283 and the bridge that carries the municipally-owned section of State Road over the Amtrak railroad tracks, installation of drainage and storm water basins, reconstruction of the four interchange ramps, traffic signal work, and installation of new guiderail, signs and pavement markings. Work under this construction contract is scheduled to be completed in June 2021 when the final two-inch wearing course layer of Superpave asphalt will be paved. During the second week of April, weather permitting, Route 722 and State Road traffic will shift to one side of the roadway to create a work area for the bridges over Route 283 and Amtrak. Once State Road traffic is shifted, vehicles over 9-feet wide will be prohibited. Eventually it will be necessary to detour traffic during reconstruction of the ramps within the interchange. PennDOT will issue a travel advisory when this work is scheduled. Route 283 averages nearly 60,000 vehicles traveled daily through this interchange. This section of Route 722 averages 13,000 vehicles traveled daily. To avoid delays, travelers should allow for additional time in their plans or seek an alternate route. Nighttime work is expected to occur more frequently and consistently as we move into the spring and should be expected each night, weather permitting, between March and November. Travelers are reminded to be alert for these operations, to obey work zone signs, to use caution when driving through work zones, not only for their safety, but for the safety of the road crews. CAMP HILL, Pa. – The 2019 Annual Membership Conference and Expo is taking place at the Toftrees Resort in State College this year on May 16-18. Nestled within the secluded pine trees of Central Pennsylvania, Toftrees Golf Resort offers guests a unique experience with resort-like amenities in a peaceful, natural setting just minutes from downtown State College. With 102 guest rooms and suites, our resort offers full-service amenities; a 4.5-star, 18-hole golf course; and a warm, welcoming staff. PMTA has sectioned off a group of rooms for attendees at the 2019 AMC and Toftrees has generously offered a discounted rate of $99 for those attending the conference. Attendees can book those rooms by clicking here. Those rooms must be booked by April 16. There is still time to register for the conference as well but those spots are limited and they are filling up at a much quicker rate than they have in the past. So act now and reserve your spot today. Register for the 2019 AMC here. The Southwest Chapter of PMTA is proud to announce its 2019 Safety Day Program. The event is scheduled for April 11, 2019 at the Doubletree Hotel Pittsburgh Cranberry in Mars, Pa. Registration for the event is now open. You may register by downloading this form and returning it either by mail (to Ron Uriah at 15 27th Street, Pittsburgh, PA 15222) or email (pmtaswchapter@gmail.com). Registration is open until April 5. Payments can be made online at https://squareup.com/store/southwest-pmta. The cost of the event is $75 for members and $85 for nonmembers. That cost covers breakfast, lunch, coffee and a 50/50 raffle ticket. Sponsorship spots are available beginning at $100. Ahead of Sunday's potential winter weather, PennDOT has announced preliminary travel restrictions. These can be adjusted over the weekend based updated storm modeling data. 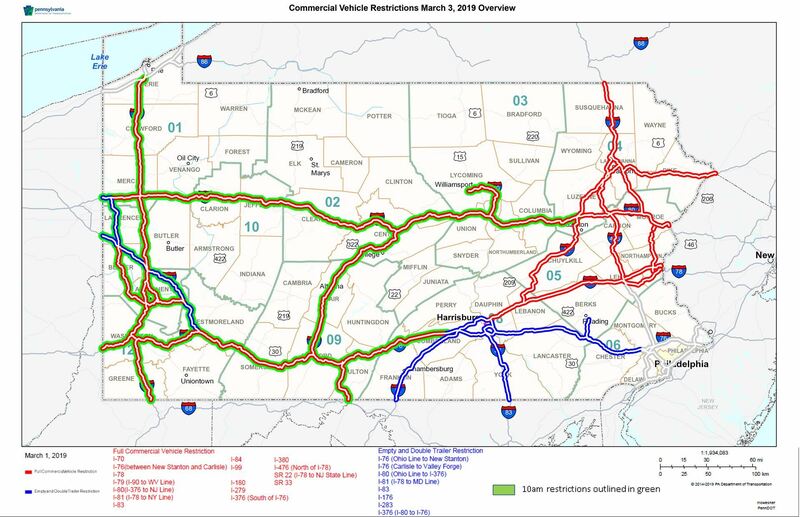 Areas in Green - Restrictions anticipated to begin Sunday March 3 at 10 a.m.
All others - Restrictions anticipated to begin Sunday March 3 at noon. CAMP HILL, Pa.—To kick off the Annual Membership Conference and Expo this year at Toftrees Resort in State College, the Pennsylvania Motor Truck Association will be hosting a golf outing at the course at Toftrees. This year’s AMC will begin May 16 and the golf is set to start at noon on that Thursday. Single golfer registration begins at $55 for those who are also attending the conference. For those not attending the conference, the rate is $100 and it includes lunch on the course and beverage cart service. To register a foursome, the cost is $220. PMTA is also still looking for sponsors for the golf event. The title sponsor slot is still available as are sponsorships of the closest to the pin, long drive and longest putt contests. 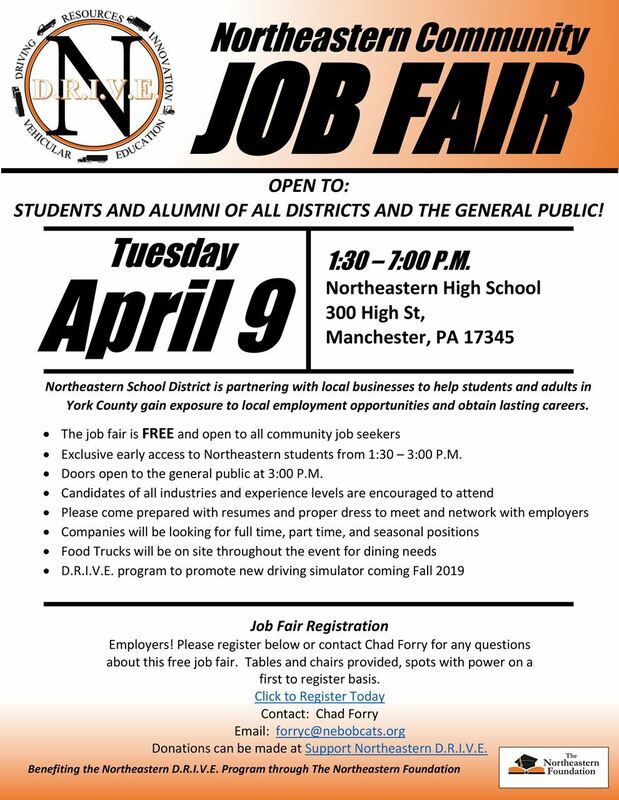 For more information, contact Tim Hoffman at 717-761-7122 ex 106. We are just 11 weeks away from the start of the AMC but spots for this year’s conference are limited so sign up now! Click here to secure your spot today. Harrisburg, PA – The Pennsylvania Department of Transportation (PennDOT) announced today that starting at 7:00 AM on Monday, March 11, its contractor will close the westbound lanes of U.S. 22/322 and implement a two-week detour to address an area of concern for falling rock just west of Newport Borough at the Howe-Greenwood Township Line in Perry County. During a routine inspection earlier this month, PennDOT engineers noticed that this location showed significant changes. After further evaluation, the engineers determined that recent weathering of the slope has left several large sandstone blocks with weakened support. Taking the current freeze-thaw cycle into consideration as well as groundwater seepage, there is concern that rocks or portions of the slope may fall onto the highway. PennDOT has contracted with the J.D. Eckman, Inc., of Atglen, Chester County, to conduct the safety improvement project. The work involves removing loose rock from the cliff face along a 1,000-foot portion of westbound U.S. 22/322 one mile west of the exit for Newport. This portion of westbound U.S. 22/322 averages more than 10,600 vehicles traveled daily. PennDOT advises motorists that westbound U.S. 22/322 will be closed to through traffic for up to two weeks while the unstable rock is removed. Until then, a detour which follows Route 34, U.S. 11/15 to Liverpool Borough, and Route 17 (Sunbury Street) to Millerstown Borough is available for motorists. Harrisburg, PA – The Pennsylvania Department of Transportation (PennDOT) announced today that on Wednesday night, March 13, weather permitting, its contractor will establish new eastbound traffic patterns through the Route 283 reconstruction project in south eastern Dauphin County. The reconstruction project covers six miles of Route 283 between the interchange with Interstate 76 (Pennsylvania Turnpike) and Interstate 283 and the Toll House Road interchange. This is a major reconstruction project for an important highway connection between Harrisburg and Lancaster that carries nearly 56,000 vehicles a day. Route 283 reconstruction activities have continued through the winter months including daylight work on the I-283/Route 283 bridge, highway lighting, traffic signals, and erosion and sediment measures. Nighttime construction activities include overhead sign structure work, drainage pipe installation and concrete barrier placement. This work is performed at night because it requires traffic restrictions which are not permitted during daytime hours. Construction schedules change quite often this time of year due to inclement weather and cold temperatures. Nighttime work is expected to continue more frequently and consistently as we move into the spring and should be expected each night, weather permitting, between March and November. Travelers are reminded to be alert for these operations, to obey work zone signs, to use caution when driving through work zones, not only for their safety, but for the safety of the road crews. Starting at 8:00 PM on Wednesday, March 13, the contractor will begin work to shift two lanes of eastbound traffic by maintaining a local lane and directing the other lane across the grass median to an Express Lane on the westbound roadway. As pavement markings are being placed, the contractor will begin installing temporary concrete barrier to separate the Express Lane from westbound motorists and the eastbound local lane from the work area. Motorists on the westbound side will be shifted first. This move will leave one lane of local traffic remaining on the eastbound roadway. The Express Lane will have no access to the ramps for the Airport Connector, Union Street and Vine Street interchanges. The single lane of eastbound traffic on the eastbound roadway will provide access to and from the Airport Connector, Union Street, and Vine Street interchanges. Please exercise caution when traveling through the work zone and pay attention to the signing and message boards identifying new traffic patterns. The speed limit on Route 283 will remain reduced from 65 miles-per-hour to 55 mph while the eastbound lanes are being reconstructed. This work is part of an $89.4 million project being conducted by Hempt Bros., Inc. of Camp Hill, Cumberland County, to rebuild six miles of Route 283 as well as the Pennsylvania Turnpike, Union Street, and Vine Street interchanges. Work began in the spring of 2017 with the rehabilitation of the three structures that carry Newberry Road, Union Street, and Vine Street over Route 283. Westbound Route 283 was rebuilt in 2018 and eastbound Route 283 will be reconstructed this year. Additional structure work includes the superstructure replacement of three mainline bridges, five mainline bridge deck replacements and one new prefabricated retaining wall. The project also includes updated drainage and guiderail, signing and pavement markings, new highway lighting, and 12 new rain gardens to manage storm water. The overall project is scheduled for completion in 2020 when the final two-inch wearing course layer of Superpave asphalt will be paved in both directions of Route 283. CAMP HILL, Pa. – The Pennsylvania Motor Truck Association is excited to announce Five Star International as the Platinum Sponsor for the 2019 Annual Membership Conference and Expo. This year’s AMCE is set to begin on May 16 at Toftrees Resort in State College with a golf outing and dinner on that Thursday. Friday will be full of speakers, vendors and meals, including the Chairman’s Banquet that evening. The weekend will be capped off by a keynote speaker Saturday morning. There are still sponsorship opportunities available for this year’s conference at the Gold, Silver, Bronze and Contributor levels. Gold sponsors will receive a complimentary single registration ($225 value), half off an exhibitor table, event signage, PMTA website recognition, a feature article in PennTRUX and logo placement on the attendee bag. Silver sponsors will receive event signage, PMTA website recognition, a free ½ page ad in PennTRUX and addition PennTRUX recognition. Bronze sponsors will receive event signage (name only, no logos) and website and PennTRUX recognition. Contributing sponsors will receive name recognition on the PMTA website. Our exhibitor packages are $1,000 for members and $1,500 for non-members and that reserves a six-foot table and two chairs in our expo hall that comes fully equipped with electricity and wifi. That price also includes registration for the full conference. Exhibitors will also receive name recognition on the PMTA website and the opportunity to select a branded gift to be given to all attendees in our attendee gift bag. To claim your place as a sponsor at this year’s event or just for more information, click here. Five Star International Trucks, Inc. was formed by Peter F. Scheler in 1974 in Erie, PA, where the company quickly became the premier transportation solutions provider in Northwestern Pennsylvania. After numerous expansions and improvements, Five Star received one of the highest honors given to International truck dealers, the Circle of Excellence award. This became a string of consecutive awards offered by Navistar. In September of 1997, Five Star International, LLC was formed as a Limited Liability Company owned by Peter F. Scheler and his sons Frederick P. Scheler and John A. Scheler. This LLC would embrace the opportunity to purchase assets of the former International Dealer in Harrisburg, PA. The formation of Five Star International, LLC led to a multitude of acquisitions and dealer enhancements. By July of 2006, Five Star would cover the majority of Pennsylvania with seven locations: Erie, Harrisburg, Lancaster, Lehigh Valley, Reading, Williamsport, and York. Five Star would partner with numerous affiliates, including Idealease, Isuzu, Workhorse, and Continental Mixer; parts would grow to become the largest International Parts Department in the Northeast; and Five Star would strive to be the most customer-focused, innovative commercial truck dealership in North America. Today, Five Star International, LLC remains a family-owned and operated business with day-to-day operations run by Fred Scheler and John Scheler. Despite our rapid growth, the Scheler Family takes an active, hands-on approach to business, personally maintaining premium customer service and a positive environment throughout the company. Five Star now has more than 250 team members who are also dedicated to taking care of customers and making them strong and profitable by running the best trucks with the best support behind them. 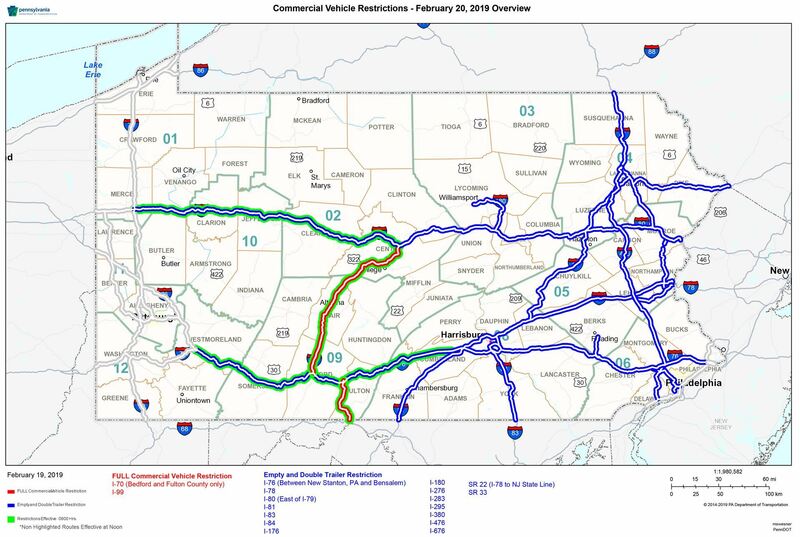 HARRISBURG, Pa. – The Pennsylvania Department of Transportation has issued another round of commercial vehicle bans ahead of the forecasted winter weather on Wednesday, Feb. 20. At 6:00 AM Wednesday, a full commercial vehicle ban (including buses) will be in place on I-70 in Fulton County (from the Maryland state line to the Turnpike) and I-99 from I-80 to the Turnpike. Please follow PMTA on Facebook and Twitter for up to the minute updates on these restrictions.